Last month, Premsingh Chavan, a farmer from Maharashtra's Marathwada region, destroyed his ready-to-harvest crop of tomatoes and cauliflowers after wholesale prices dipped so low that it did not cover the cost of transporting the harvest to the nearest wholesale market. In a video of the incident shared widely on social media, an angry and helpless Chavan was seen thrashing cauliflowers and uprooting tomato plants. "I have heard that if my tomatoes can be made into sauce (ketchup or puree), it would fetch me a better price," Chavan told Mint, while ruing that returns to farming are such that he cannot sustain his family, let alone pay the meagre fee for his son's education. Chavan's predicament is shared by millions of farmers across India. Over the past year, tomato farmers in Karnataka, potato growers from Uttar Pradesh and onion producers in Madhya Pradesh, among others, have dumped their produce by the roadside for want of decent price. The food processing sector has a critical role to play here through value addition and helping farmers receive better prices. 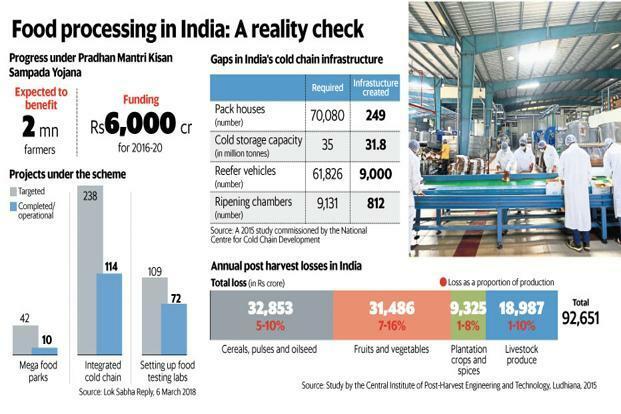 Currently, according to the food processing ministry, just about one-tenth of India's agriculture produce is processed, and the ministry aims to raise it threefold. Infrastructure gaps in cold chain and processing units also lead to a large wastage of agricultural produce. According to a 2015 study by the Central Institute of Post-Harvest Engineering and Technology, Ludhiana, India's post-harvest losses in fruits and vegetables were a staggering Rs31,500 crore. About 7-12% of vegetable production was wasted before it reached the consumer, the study showed. To address this problem, the centre in 2017 launched the Pradhan Mantri Kisan Sampada Yojana (PMKSY) with a financial outlay of Rs6,000 crore for four years. The programme aims to build an efficient supply chain from the farm gate to the retail outlet by creating an integrated cold chain and value addition infrastructure and expanding India's food processing and preservation capacities. However, some experts say India's cultural habits and geo-climatic conditions dictate what consumers prefer to eat, limiting the growth of processed food industry. "In India, unlike in the West, 99% of fresh agricultural produce is consumed fresh and, therefore, the processing industry cannot match the size in western countries, where long winters require intensive processing," said Pravesh Sharma, former agriculture secretary of Madhya Pradesh, who also headed Small Farmers' Agribusiness Consortium (SFAC)—a specialized agency under the agriculture ministry. Sharma, who now heads agriculture start-up Kamatan that supplies perishables to retail chains and restaurants, says farmers grow different vegetables through the year and due to India's climate diversity, production of seasonal vegetables move from warmer plains to cooler hills with changing seasons. "There is no compelling economic argument for the government to invest heavily into food processing... after all, there is a limit to how much potato chips Indians can eat," Sharma said, adding, "farmers will gain more from a well-functioning market, where produce travels freely and prices are not determined opaquely by trader cartels."